SpringyFlash 2019: How to use hidden boxes and reusable content to save time managing your web site. Welcome! At ACRL 2019, I presented "Saving Time with Hidden Boxes and Reusable Content" as part of the SpringyFlash sessions in the Springshare booth. This guide is the essence of that presentation and explains some of the ways that I use hidden boxes and reusable links to save time and standardize content within our LibGuides-based library website. 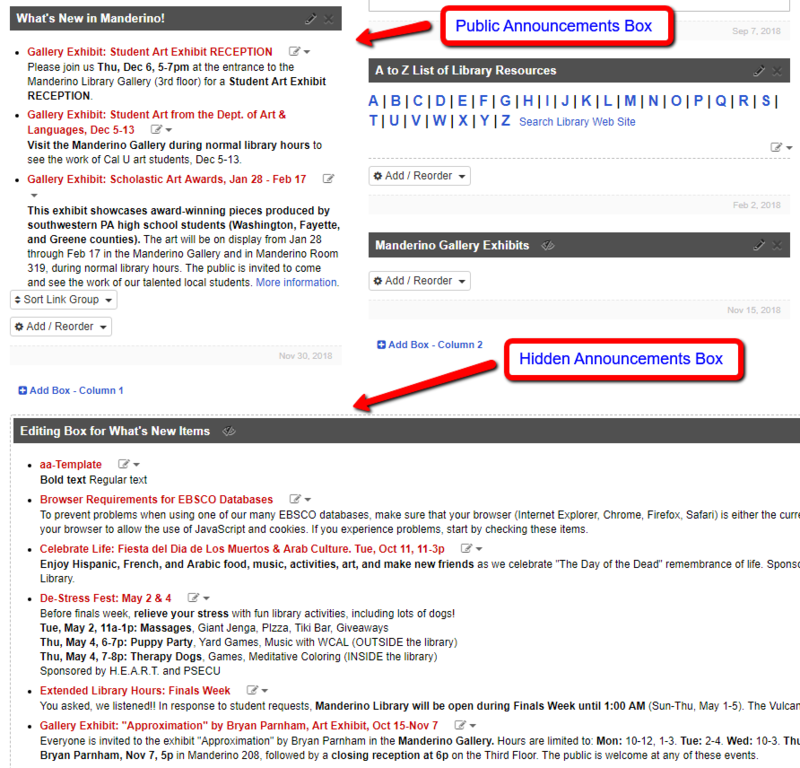 These techniques are applied to: managing announcements on both the home and Gallery pages, displaying special announcements in a top banner box that is made visible when needed, providing reusable resources for the other LibGuides editors to use, and curing buried hyperlinks in Rich Text boxes. 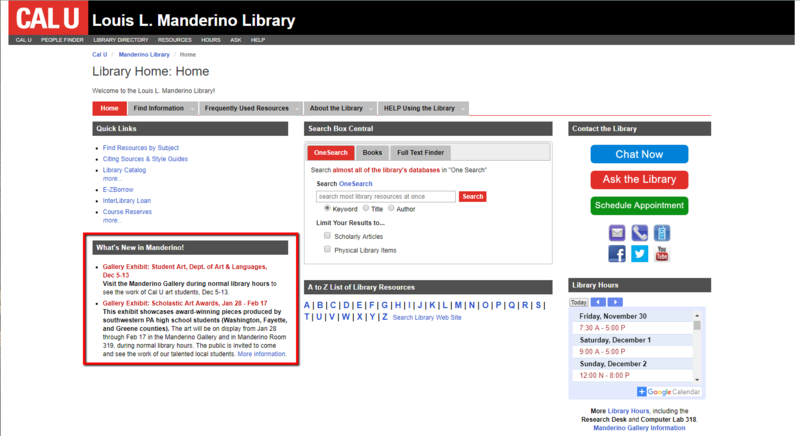 General library announcements are presented as asset links in a “What’s New in Manderino!” box on the library home page. These links, however, do not “live” in the "What’s New" box. Instead, they are created in a hidden box at the bottom of the home page. In order to display the announcement, I reuse the asset via a link (not a copy) in the "What’s New" box. When it is no longer needed, the announcement is removed from the "What’s New" box--but remains in the hidden box for later reuse. The hidden box at the bottom of the home page is a repository of announcements old and new. Because old announcements live on in the hidden box, they can be reused when the event is repeated. To reuse, I update the link information in the hidden box and again add it to the "What’s New" box. Since many events (or similar events) repeat semester after semester, this process saves time managing announcements. When adding an asset from the hidden box to the "What's New" box, I recommend using a "link" instead of "copy" in order to facilitate the preservation of edits for future use. Should it be necessary to edit a posted announcement, I edit the asset in the hidden box. Because the public announcement is “linked” to this asset, one edit fixes both copies. This is important since the asset in the "What's New" box eventually will be deleted. If the public item were “copied” from the hidden box, any edits to it would not be reflected in the hidden box asset. If I wanted to preserve the edited language for future use, I would have to edit both assets. Using a "link" simplifies the process. 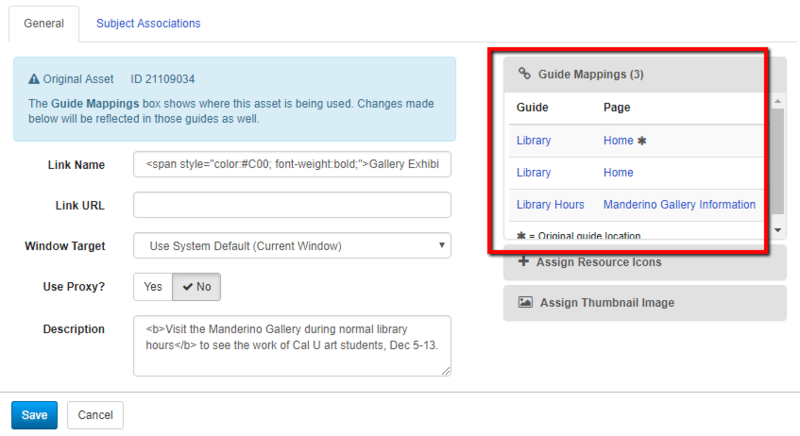 As explained in the next tab, Gallery announcements are also drawn from the hidden box and appear in a third location. This makes "linking" (rather than "copying") announcements even more important. This is an example of the coding for a reusable announcement. Note the mapping information.